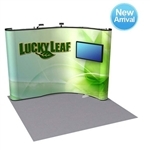 10 X 10 Pop Up Displays are our number one sellers, due to their portability and affordability. At this size, you can create an impressive backwall that can later expand for larger spaces. Showcase your brand with impact, by choosing from our wide variety of options that accommodate to your style and budget. Complement your 10-foot x 10-foot display with functional accessories, such as counters, flooring, and literature stands.